Back to Bonnie Bell’s Bistro! I have been a fan of Bonnie Bell’s Bistro www.bonniebells.com, since they first opened over 10 years ago in the building which now serves as a home to The Saints Street Inn. They are now located in Downtown Lafayette on Jefferson Street. I can remember during water aerobics at Lourdes Health Center (yes, I did water aerobics…actually loved it and really miss my “classmates” since being a dropout!) 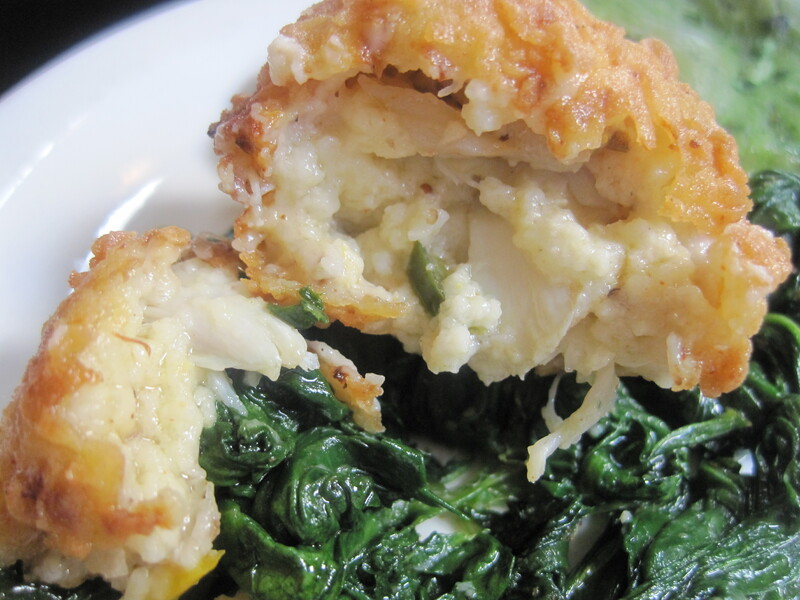 as we were going through our exercises, we would start talking about – food…that is when I first heard about the infamous Bonnie Bell’s Crab Cakes! 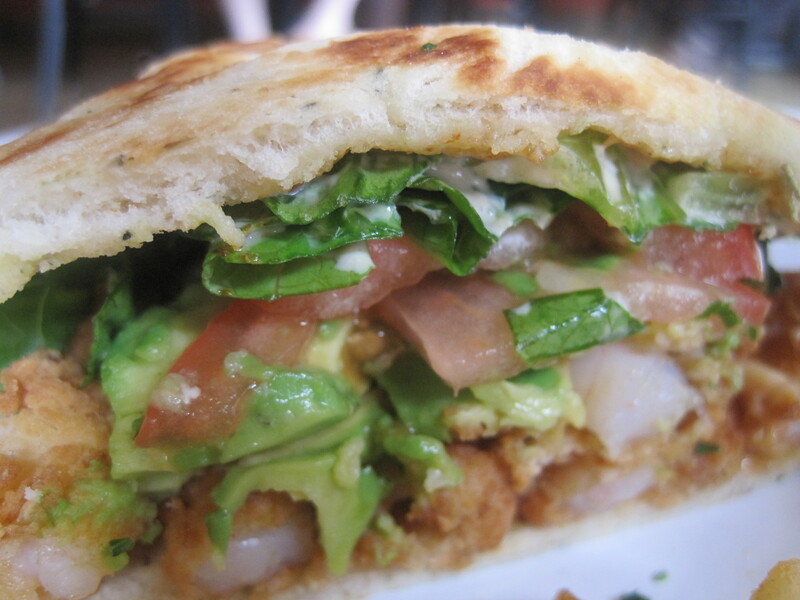 Paddling around on a noodle, in the pool, talking about crab cakes…yes, I do miss this class! 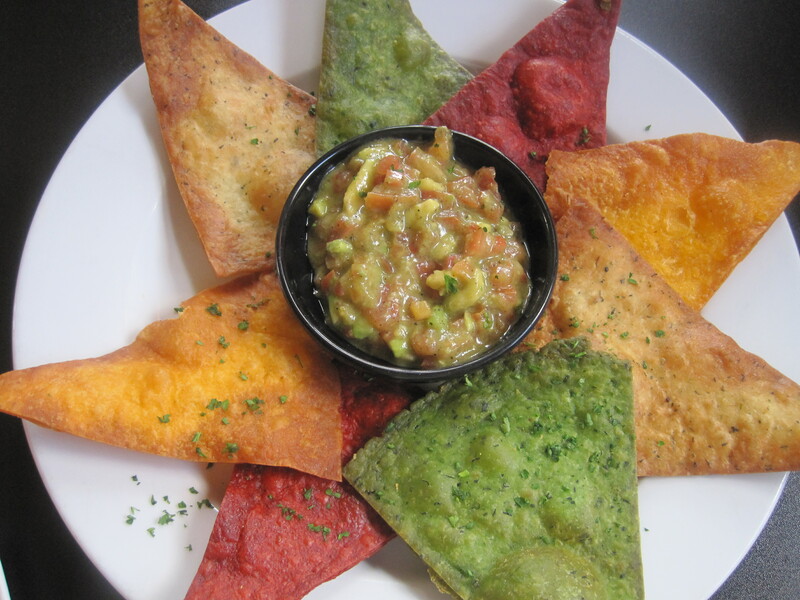 Started with an old favorite: Tri-Colored Chips With Avocado & Tomato Salsa…Lightly fried sun-dried tomato, cheesy jalapeno and herb garlic tortillas that have just the right amount of crunchiness without being hard or dry – to dip in the creamy, bright and “not too hot” avacado & tomato salsa. Love it every time! As an appetizer, we just had to have crab cakes…This incredibly beautiful dish is called Bistro Crab Pearls! 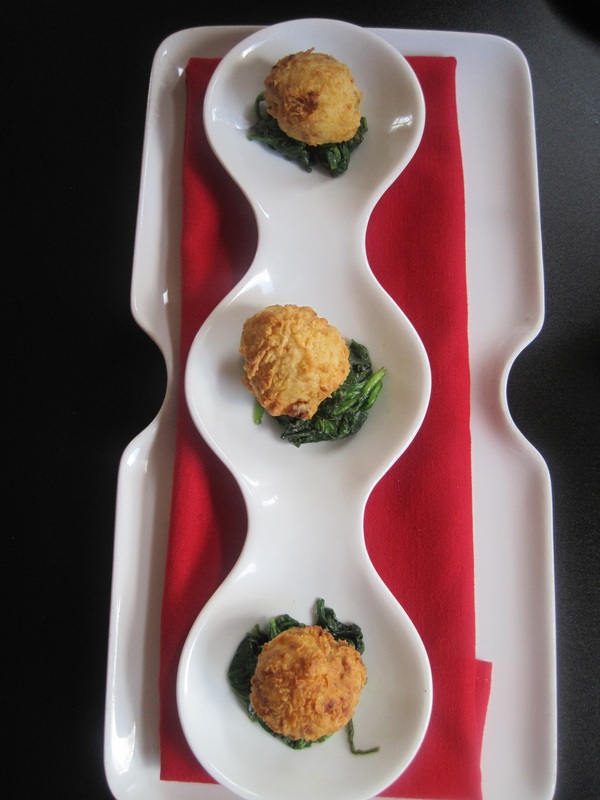 Small luscious bundles of joy – crab cakes perched on a little nest of fresh sautéed spinach…They first win you over with the inventive artistic presentation – but then when the flavors hit your palate with its rich creaminess and slight crunch when you bite into these little treasures, your knees get weak! The contrast between the sweet bechamel sauce in the crab cake and the savory sautéed spinach was divine…Sinply delicious! 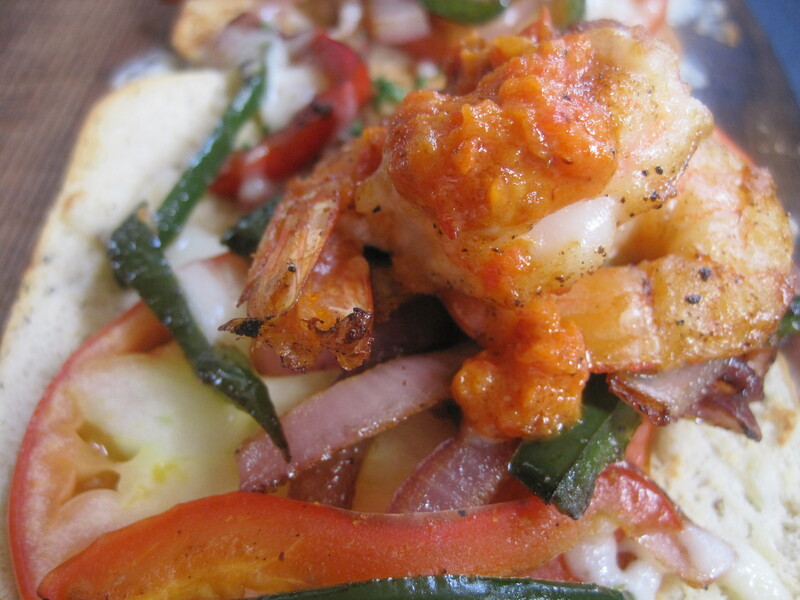 My dining pal opted for the Shrimp Flatbread Pizza…sounds simple, right? Nothing simple about this unique twist on “pizza”! 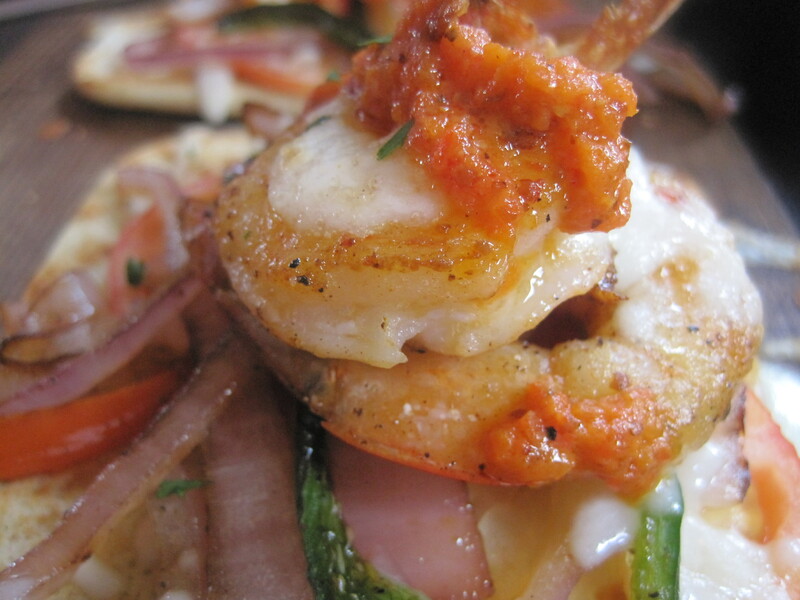 The fresh flatbread is topped with melted provolone cheese and smoked Chile’ sauce, then huge grilled shrimp are stacked on top of robust creole tomatoes, roasted purple onions and green peppers. 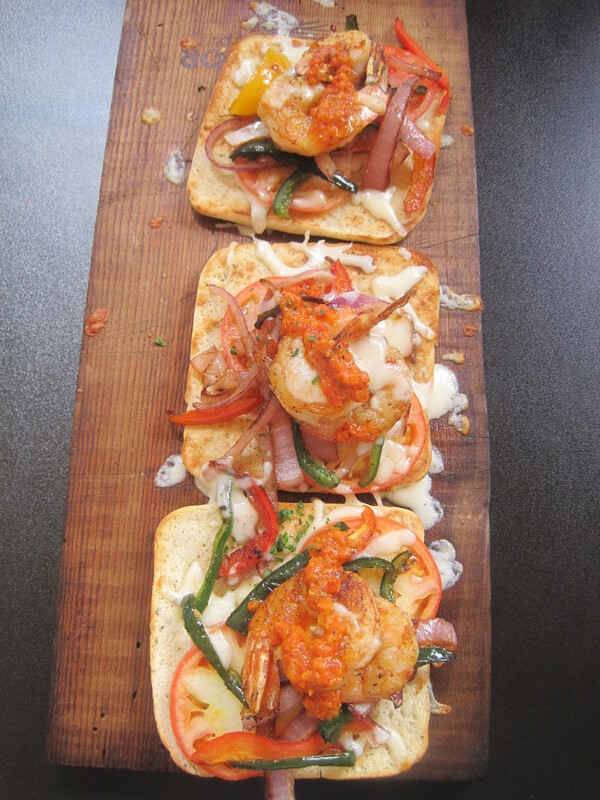 If that is not enough, this dish is presented on a beautiful rustic wooden board…fabulous! Dessert? I will blame this one on my 7 month pregnant dining buddy… (Although, I never can finish a meal without something sweet!) 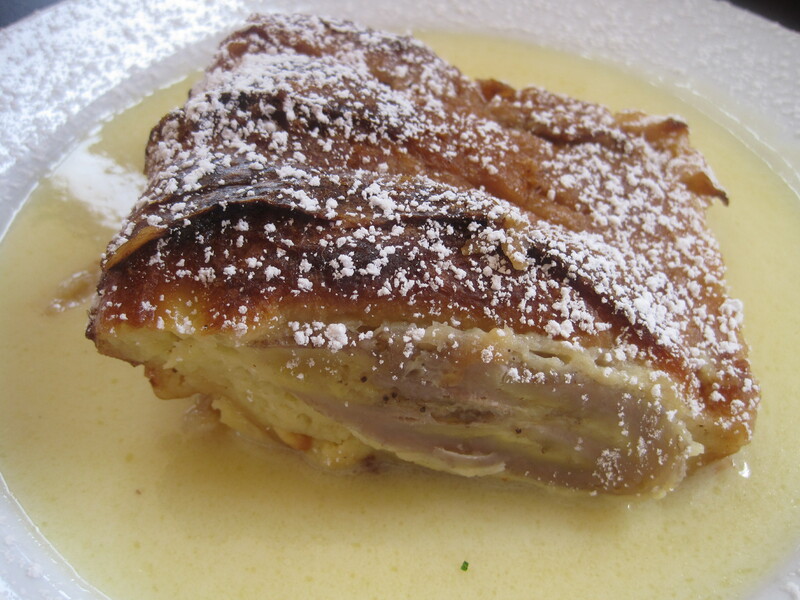 Banana Foster’s Bread Pudding! As we were being served, I kept asking to meet the “artist” in the kitchen…this was one of the most beautiful meals that I have had in a while. Every dish was so well thought out, artistic and delicious! This is what I call “Food That Works”….Can’t wait to take another trip back to Bonnie Bell’s Bistro – or maybe I should re-think that Water Aerobics Class! Thanks for the review. It looks like a nice place to eat. I was impressed with the presentation of Bistro Crab Pearls. Whenever I make it to Lafayette, this will be my lunch destination! Sounds scrumptious! Hey Carolyn, like you it has been a while since I went there but I will be going back after reading this, thank you, you always make me feel as if I am sitting in the restaurant with you. Thanks, Karen! I wish you had been with me…soon! Of course, what a splendid website and instructive posts, I surely will bookmark your blog.All the Best!